Growing up, I dated. Not only did I date, I dated badly. It was a time of life fraught with poor decisions, several of which had a life-long impact. So naturally as my own children grew, I wanted something different for them. I hoped and prayed, and attempted to parent in a way that would hopefully lead to a different dating situation for them. I remember when the kids were about 8 and 9 I heard about and alternative to dating that sounded very different. I heard the word Courtship. The sound of the word evoked visions of sunset buggy rides, over open fields, to church socials; during a period of time when life moved at a manageable level of speed. This word was everything the genteel novels of Little Women, Emma and Ann of Avonlea could ever hope to describe. When I asked people how to “do” this Courtship thing, I would receive a bit of a blank stare and an answer that told me it was something that each family had to define for themselves. After fighting back the urge to scream “GEE! Thanks a lot for nothing!” I would resume our normal path of teaching intentional choices and trying to facilitate lots of honest, open communication. So, when the opportunity came to read a real live book on the subject of Courtship and Dating came along, I jumped at the chance to actually understand this idea that currently only seemed to be a vaporous fantasy from the past. The book Courtship & Dating:so what’s the difference? is a book written by Dennis Gundersen, and available for purchase at Grace and Truth Books. If you happen to be like me, desiring a different path for your children than the mine-field of dating you may have experienced, this book is the perfect tool to help you understand courtship. It is a quick and easy read that I am quite sure you will find yourself underlining, highlighting and sticky noting for future reference. The book includes valuable explanations on courtship and dating, it has bonus articles that discuss the importance of modesty, marriage with out the consent of parents, and advice from Martin Luther on parents role in their Children’s Marriage. All that information priced at $5.75, you really can’t afford to NOT have it in your parenting tool box. I felt completely encouraged as I read this book. As I read it, I found that we had always been on the parenting track of courtship, we just didn’t call it that. We had been striving to create a trust filled relationship with our children where it was safe to discuss their potential thoughts and feelings about those of the opposite gender. A relationship where our parental input would not be viewed as threatening and judgmental but as loving advice. That friends IS Courtship. If you have children, no matter the age now, they will eventually come to an age where they will want to share their time with someone of the opposite gender. Don’t wait until then to have a game plan. It is never to early to start teaching them how to avoid the land mines. To see what others have to say about the other great books available from Grace and Truth Books, follow the link below. 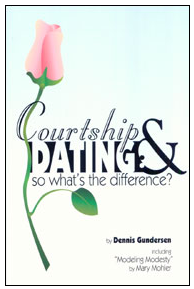 I was send a copy of Courtship & Dating: so what’s the difference?by Dennis Gundersen via Grace and Truth Books, free of charge, solely for the purpose of this review. No other compensation has been received. i’ll be curious to see how this plays out!